Ticket for the STP Friday Bus. 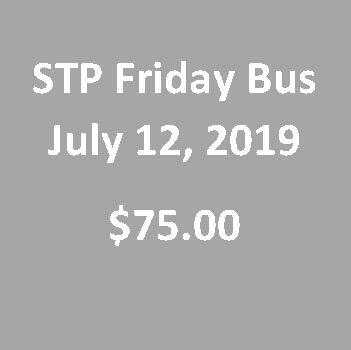 STP Friday Bus Ticket for rider and bicycle from Portland to Seattle on Friday, July 12, 2019. Do you need to get your bike and yourself to Seattle to ride the 2019 STP? PWTC has a way! On Friday, July 12th, you can ride a luxury tour bus while your bike, wrapped in a furniture blanket, rides in a truck to Seattle. DoubleTree Hotel- Lloyd Center 8:00 a.m.
Online Register and pay right here! You must include a self-addressed stamped envelope (SASE). If you want overnight parking at the DoubleTree Hotel, include an additional $35. Unlimited seating through July 5. After this date, email for space availability. There will be NO REFUNDS. If for some reason you cannot use your reserved space on the bus, resale of your space is permitted, but it is yours to sell. For additional information about the Portland to Seattle Friday bus, email Bill Hamilton at stpfridaybus@pwtc.com or call (503) 778-0552. Friday bus confirmations and parking tickets will be returned in your SASE.